Photo(s) by 22 North PhotographyDrive M-22 for incredible views. Mason and Manistee counties offer endless opportunities for leaf peepers. Walk historic neighborhoods lined with Victorian homes and maple trees, paddle lakes surrounded by acres of unspoiled forest or drive M-22 stopping at stunning vistas and delicious eateries along the way. 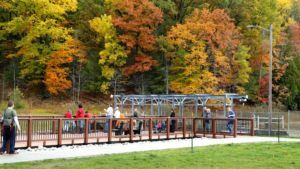 Here are our favorite ideas for fall color tours in Ludington, Manistee, Onekama and Arcadia, plus travel tips, maps, restaurant recommendations and more! Check our fall color map every week to find out where peak foliage is! Take a drive along Conrad Road. Photo by Todd Reed. 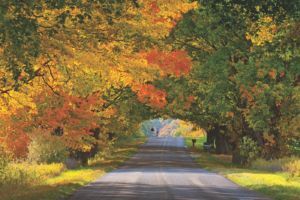 Whether exploring on foot, by car or bicycle, Mason County offers a variety of ways to experience fall color. Happy travels! Ludington State Park: They don’t call Ludington State Park the Queen of Michigan’s state parks for nothing. Explore 21 miles of trails, a canoe trail, Hamlin Lake, Big Sable River and more than 5,300 acres of unspoiled natural forest. While there, go on a Big Sable Lighthouse adventure. Ludington School Forest offers more than five miles of urban biking and hiking trails plus disc golf. View a map. Cartier Park is another popular in-town trail system set in a 68-acre natural area with a paved, one-mile walking/cycling loop plus a four-mile singletrack mountain biking loop. Mason County Cultural Trails: Road travelers can see fall colors while learning about the area’s culture and history by driving a self-guided cultural trail with cell phone narration. Routes include the Lumber Heritage Trail, Barn Quilt Trail and Agricultural Trail. On the Agricultural Trail, stop by Orchard Market for local produce and Kistlercrest Farms for apples and maple syrup! 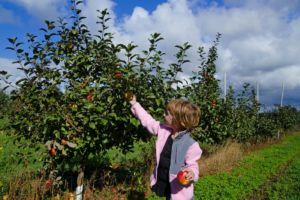 Pick apples at Christofferson Farms! Photo by Brad Reed. This driving/biking route takes you through downtown Ludington and along scenic country byways all within 10 miles of town. Fun stops along the way include Amber Elk Ranch, historic White Pine Village and the Lake Michigan Recreation Area. Downtown Ludington has some incredible restaurants and breweries, including nine new foodie hotspots in the past two years. Grab a beer and lunch at Ludington Bay Brewing Co. or stop by Biercamp Market for picnic supplies. Whether you want to stay at a quaint bed & breakfast or a rustic cabin, Ludington has plenty of hotel/motel options. For an unforgettable stay, book a room at Ludington’s Cartier Mansion. Paddle the Manistee River. Shot by 22 North Photography. Manistee County is full of picturesque views, outdoor recreation opportunities and cute shops and eateries. Hit the road! 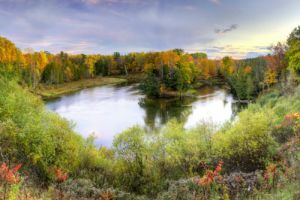 Manistee County Visitors Bureau has mapped out three fall color tour routes with interactive maps and fun stops along the way like wineries and scenic lookouts. Pick one and spend the day exploring! Lake Michigan Coastal Tour/M-22 Scenic Drive: This is always a gorgeous tour, and it doesn’t hurt that USA Today readers voted it the Best Scenic Autumn Drive! Inland Tour Route: This route goes past Iron Fish Distillery, Marilla Museum and Pioneer Place, Little Manistee River Weir, St. Ambrose Cellars and more awesome attractions. Coastal Tour Route: Shop at Macbeth’s, go wine tasting at Linebacks, take in the incredible view at Arcadia Overlook and more while you drive along the lakeshore. Drop in your kayak at the Little Manistee River Weir. Photo by Manistee County Visitors Bureau. 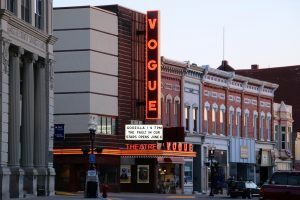 End the day with a movie at the Vogue or dinner downtown. Photo by Manistee County Visitors Bureau. Downtown Manistee has a number of restaurants to choose from (here’s your restaurant guide). Relax on the deck at Bluefish and watch boats passing on the river or grab a quick bite at The Fillmore. While you’re in Onekama, enjoy a coffee and pastry from Yellow Dog Cafe. Step back in time to the Victorian era with a stay at the Ramsdell Inn or Dempsey Manor. Here are more Manistee lodging options.